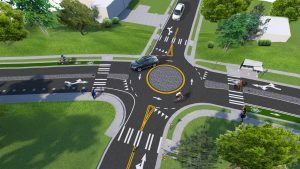 DAVENPORT was selected to provide transportation engineering, environmental, and design services for the complete street transformation of Livingston Street and a portion of Depot Street. The City of Asheville desired to make the street safer and more comfortable for pedestrians, cyclists, and transit users. The project presented a unique set of challenges in that the work had to be completed within an aggressive six-month time frame and improvements could not involve any right-of-way acquisition in order to stay within the time line of a TIGER VI grant. 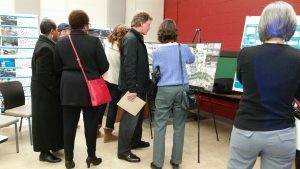 DAVENPORT worked closely with the City of Asheville, stakeholders, and the community along the corridor to ensure the specific needs and concerns for the corridor were addressed. DAVENPORT attended public input meetings to compile community comments. As part of these meetings, DAVENPORT created displays to show various potential improvements. 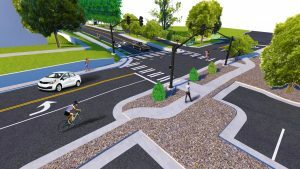 In addition, DAVENPORT created a fly-over animation and graphic renderings to aid the City in communicating the proposed improvements to the neighborhood. The project was federally funded, and therefore, the National Environmental Policy Act of 1969 (NEPA) applied. Environmental services included the preparation of a NEPA Type-II Categorical Exclusion (CE) document. DAVENPORT performed on-site investigations to identify environmental features located within a 250-foot radius of the project area. In addition, DAVENPORT utilized Geographic Information Systems (GIS) data to perform a cursory environmental screening of the project area to identify potentially direct, secondary and cumulative environmental impacts due to the project design alternatives. DAVENPORT conducted extensive research for preparation of the CE, and coordinated with federal and local agencies, as required. DAVENPORT prepared a NEPA Type-II CE document that detailed the purpose and need for the project, the proposed improvements, and provided additional supporting documentation, as required. A Type-II CE approval was obtained. In total, DAVENPORT’s scope of work included public involvement, traffic engineering, a NEPA Environmental Assessment, conceptual roadway design, full roadway design, sedimentation and erosion control design, storm drainage design, transportation analysis, and signal design.